↑ Bhikkhu Sujato, Sects and Sectarianism, p. 131. ↑ 12.0 12.1 12.2 12.3 Heirman, Ann; Bumbacher, Stephan Peter, eds. (2007). The spread of Buddhism. Leiden: Brill. ISBN 978-9004158306. ↑ Presenters: Patrick Cabouat and Alain Moreau (2004). 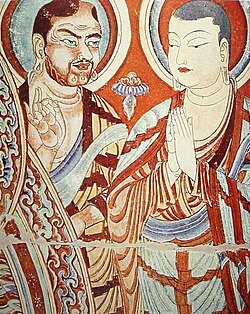 "Eurasia Episode III - Gandhara, the Renaissance of Buddhism". Eurasia. Episode 3. 11:20 minutes in. France 5 / NHK / Point du Jour International. ↑ Sujato Bhikkhu. "About the EA". ekottara.googlepages.com. Retrieved on 2013-02-11. This article uses material from the September 2018 revision of Dharmaguptaka on Wikipedia ( view authors). License under CC BY-SA 3.0. This page was last edited on 1 October 2018, at 13:12.